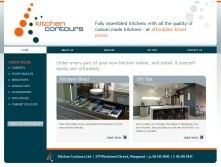 As the foremost kitchen designers and manufacturers in Wellington and the Lower North Island - our aim is to provide the best quality service for our customers whatever the budget and practical requirements. Not only giving advice but providing good workmanship within a reasonable timescale to cut down on any unnecessary inconvenience to you. Are you looking for a fully assembled kitchen with all the quality of a custom made kitchen - but at affordable kitset prices?